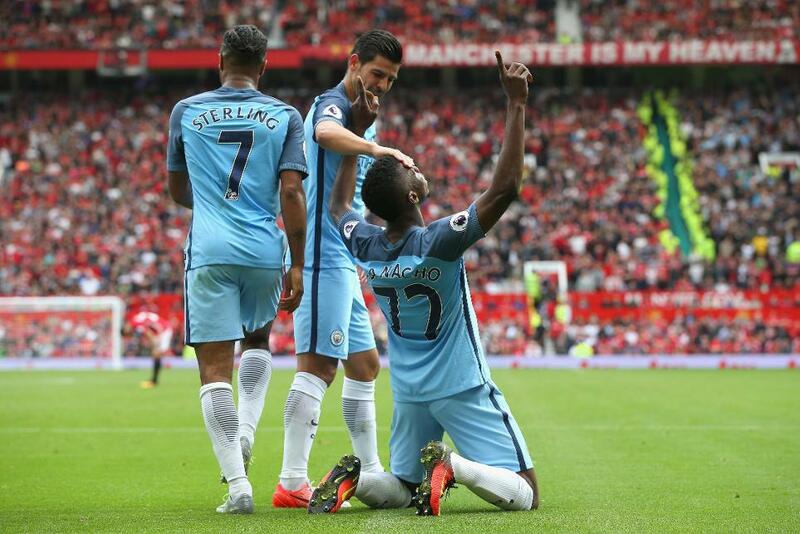 Kevin De Bruyne and Kelechi Iheanacho were both on target as Manchester City overcame Manchester United in an enthralling 2-1 victory at Old Trafford. Pep Guardiola's side raced into a two-goal lead in a pulsating opening 36 minutes before Zlatan Ibrahimovic's fourth goal in as many Premier League matches halved the deficit just before the break. City held on in the second half to maintain their 100% record and end United's. De Bruyne put City ahead on 15 minutes after reacting first to Iheanacho’s flick-on from a long punt from Aleksandar Kolarov. The Belgian burst through before sending David De Gea the wrong way. City were dominant in the first half and De Bruyne was prominent in the second goal when he curled a left-footed shot off the far post, the ball bouncing back for Iheanacho to scoure. United found a way back when goalkeeper Claudio Bravo, on his Premier League debut, dropped Wayne Rooney’s free-kick, and Ibrahimovic reacted with a superb half-volley. Half-time substitute Marcus Rashford made a lively contribution after coming on, setting up Ibrahimovic to fire over from six yards, before De Bruyne hit a post again and De Gea thwarted Nicolas Otamendi with a brave double-stop.